The transistor sitar was the first of its kind & developed in 1962. During that era the amplification system was not that advanced & the sitarist were always struggling to get the desired sound as at times the microphones and P.A. system was not up to their satisfaction. My father, a sitarist & maker as well, thought of this trouble shooting & went on to make the first amplified sitar. This sitar had a transistorised amplifier in the main tumba with volume & tone control and on the other end of the sitar an in-built speaker was installed. Therefore the dependence on the microphone, monitor & sound engineer was avoided. Pt. Ravi Shankar, his guru performed on this sitar in the year 1964 at Sapru House in New Delhi & this was a complete Classical Concert. Pt.ji also announced about my father’s creation in his concert. Later Ust. Vilayat Khan also performed on this sitar. Transistor sitar became popular among the classical musicians & light classical players in that era & kept its presence for about 7 to 8 years until other advancements were made on microphone & P.A. systems and good options came along. Transistor sitar was bit heavy because of the built –in amplifier and speaker & had its own trouble shooting of logistics. 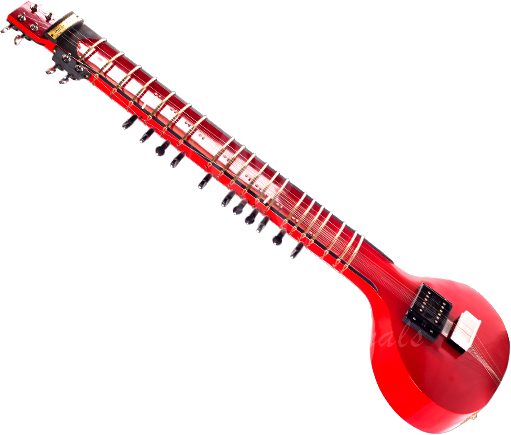 Musicians thought of this sitar as to be played in light music rather than classical music. The music scene changed a lot after the Beatles visit to India. They promoted the sitar sound in their music & gradually musician became aware of sitar sound & appreciated it. They wanted to improvise the sound in their own music scores. On the other hand, the Zitar was developed in the year 2006. The experiment started when Ajay had to perform with a western band & his sitar was not heard by the audience as my sound level was overpowered by the loud sound of the electric guitar, Bass, Keyboard & Drums. In the year 2003 me & my respected father started to develop the travel sitar which was known as Ovation sitar . My father unfortunately passed away in the year 2007 while we were continuously experimenting on it. I further took forward the experiment and developed a smaller dimension sitar which could be electrified. This was finally called the Zitar. I have played this sitar in my album “Lime Green Bindi” Project Hypnotic Gurus & dedicated it to my late father. Musicians have appreciated my work & I thank God for this. Since then the Zitar is being played all around the world & has become very popular among musicians, who are using it in World Music, Hollywood & Bollywood. The Zitar is 41” in length with a flat base semi-hollowed structure & made from one piece of well seasoned Teak wood. We have used machine head screws for main strings tuning & fitted a double coil humbucking pick-up for amplification. The best amplification advice is to use a good quality pre-amp processor & connect to your choice of amp-speaker. By grace of God, I am glad that musicians have embraced my work. There are lots of makers who have copied my design & are claiming it as their own work. I take it in a good sporting way & thank God for letting me start the trend. Musicians performing a solo classical set up would prefer to play acoustic sitar and when performing the world music set up or playing with loud levelled musical instruments would definitely play the Zitar. Musicians like Pt. Ravi Shankar ji, Ust. Shujaat Khan, Prateek Chaudhuri, Niladri kumar, Prem Joshua, to name a few, are playing the Zitar in their own way.